Was the Biblical Miriam the First Savvy Auntie? Rabbi Jason Miller (@RabbiJason), an educator and blogger, is president of Access Computer Technology and director of Kosher Michigan, a kosher certification agency. Rabbi Jason Miller, a popular writer and blogger (http://blog.rabbijason.com), lives in Detroit with his wife and children. He is the president and owner of Access Computer Technology and also serves as the director of Kosher Michigan, a kosher certification agency. Follow him on Twitter at @RabbiJason. On an episode of the NBC TV drama "Parenthood," the topic of faith and religion was discussed in the context of whose role it is to teach children about God and spirituality. When a grandmother, with good intentions, took it upon herself to bring prayer into the life of a young boy, his parents took exception. In truth, however, it is not always the parents who introduce religion or faith to children. In some families, it may be a loving aunt who teaches about matters of faith. A Jewish child being raised by secular parents may look to an aunt or other family member to learn about holidays and religious traditions. On the Jewish calendar, this holiday is one of the big ones. Even members of the Jewish faith who aren’t regular synagogue attendees make a point of attending services on Rosh Hashanah and Yom Kippur, the Day of Atonement, which occurs 10 days later. You’ll notice local synagogue parking lots are overflowing on these days. For some, Rosh Hashanah services are an opportunity for spiritual renewal and introspection. For others, this is a time to visit with friends and enjoy time with family. The holiday celebrates the beginning of the Jewish calendar, but it is also a period of repentance. Beginning a month prior to Rosh Hashanah, Jewish people make an effort to offer forgiveness for their sins. Prayer, charitable giving, and repentance are the three ways to be written in the metaphorical book of life by God for another year. In addition to the beginning of the Jewish calendar, Rosh Hashanah is a commemoration of the creation of the world, according to the Torah – the Jewish Bible. 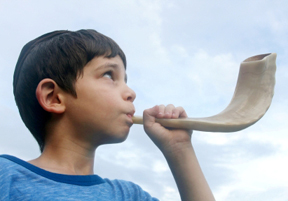 Perhaps the most common symbol of Rosh Hashanah is the ram’s horn that is blown in the synagogue. With 100 blasts, the shofar is considered a “wake-up call” to remind the Jewish people about the key task at hand — repentance. Families gather around the table for large celebratory meals on Rosh Hashanah. Traditional Jewish staples such as matzah ball soup, gefilte fish, and brisket can often be found on the dinner tables (especially in homes with Eastern European lineage). There are many foods traditionally eaten on Rosh Hashanah to symbolize the holiday’s many themes. Round challah (egg bread) is to signify continuity. Apples are dipped in honey as a blessing for a sweet new year. There is a custom to have a new and different fruit on the table as well. Just as with any faith tradition there are different levels of observance among the adherents. Orthodox and Conservative Jews will observe two days of the holiday while most Reform Jews will only observe one. Many public schools in the area are closed for at least the first day of the holiday. Some Jewish people will abstain from driving on the holiday and will walk to and from the synagogue instead. Adults will stay home from work, and many students will miss school if it is in session. May all the Savvy Aunties enjoy a sweet and joyous new year.